Serve this incredibly delicious, fork-tender pork dish over a bowl hot rice. Make it a complete meal with a cool, green salad and warm flour tortillas. Pat pork cubes dry with paper towels; season with salt. Heat 2 tablespoons of oil over medium-high heat in 5 to 6-quart heavy Dutch oven. Add half of the pork. Cook 2 to 3 minutes or until browned, stirring occasionally. Using slotted spoon, transfer pork to bowl. Brown remaining pork in remaining 1 tablespoon vegetable oil. Add all pork back to Dutch oven. Stir in onion, almonds, jalapeño and garlic. Cook, uncovered, over medium-low heat for 5 to 7 minutes or until onion is crisp-tender and translucent. Stir in coriander seed, cumin seed, smoked paprika and ancho chile powder; cook for 1 minute. Add beer and apple cider and bring to a simmer. Cover and gently simmer over medium-low or low heat for 2 hours. If desired, cool mixture. Cover and refrigerate for up to 1 day. Spoon and discard fat from top of chilled mixture. Heat mixture over medium-high heat. Stir in lime juice and zest, and chocolate into hot mixture. Serve over rice. 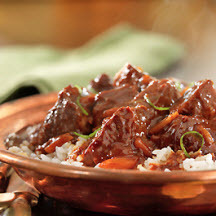 To Plate: Spoon rice into shallow bowls and top with pork in molé sauce. Tip: If Mexican chocolate is unavailable, use 3 ounces bittersweet chocolate plus 1 1/2 teaspoons ground cinnamon and 3 drops almond extract. Nutritional Information Per Serving (1/8 of recipe; 3/4 cup pork molé plus 3/4 cup rice): Calories: 530; Total Fat: 18g; Saturated Fat: 4g; Cholesterol: 75mg; Total Carbs: 57g; Fiber: 4g; Protein: 30g; Sodium: 250mg.